Here’s the last of the three new Captain America figures I picked up last week, and OMG, it’s Crossbones. When looking at the Hydra Soldier, I commented that I never expected to find him at retail. Well, that goes double for Crossbones. He’s a pretty sought after figure in the sea of Cap variants, and yet there he was hanging right on the peg. Cool! Once again, it’s the Captain America movie-inspired card. I think I’ve said all I have to say about this packaging. It looks great and really makes me want to buy the figures, but not enough to buy a dozen stupid mission-themed versions of Cap. Crossbones is a pretty hefty guy so he fills out the card nicely, along with his small arsenal of weapons. The insert in the bubble points out that this figure is from the Comic Series. 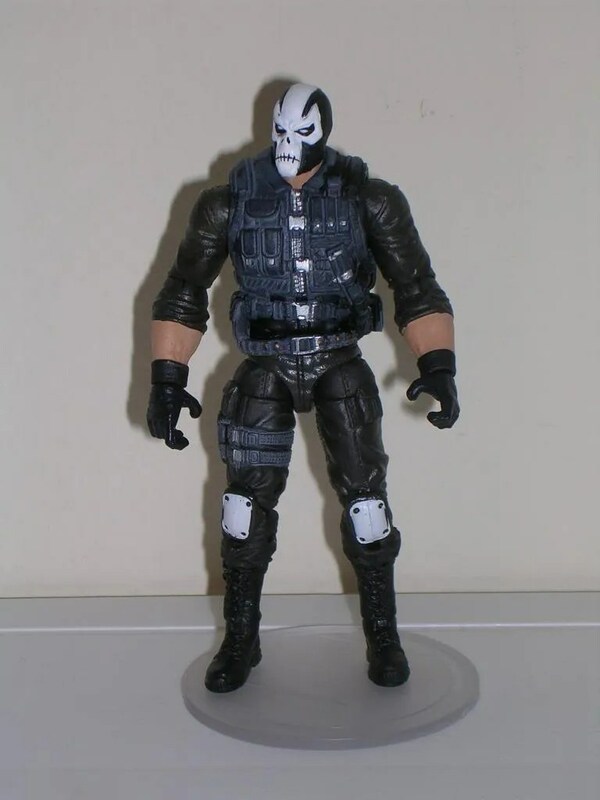 Hasbro did a fantastic job commiting Crossbones to plastic. The last time I remember seeing this guy in figure form was as part of Toy Biz’s Marvel Legends and that was a pretty amazing figure. Does Hasbro’s smaller scale version of ‘Bones hold up? Yeah, it really does. There are a few minor differences, like this one has sleeves and kneepads. Hasbro did actually manage to get quite a bit more sculpted detail into this smaller figure, and that’s very impressive. The mask looks great and the paint apps are nice and crisp. Most of the sculpting here went into his bulky vest, which is detailed right down to each and every ammo pouch, the zippers, and the combat knife. Have I said impressive yet? I did, but hey it fits. This is an impressive little figure. 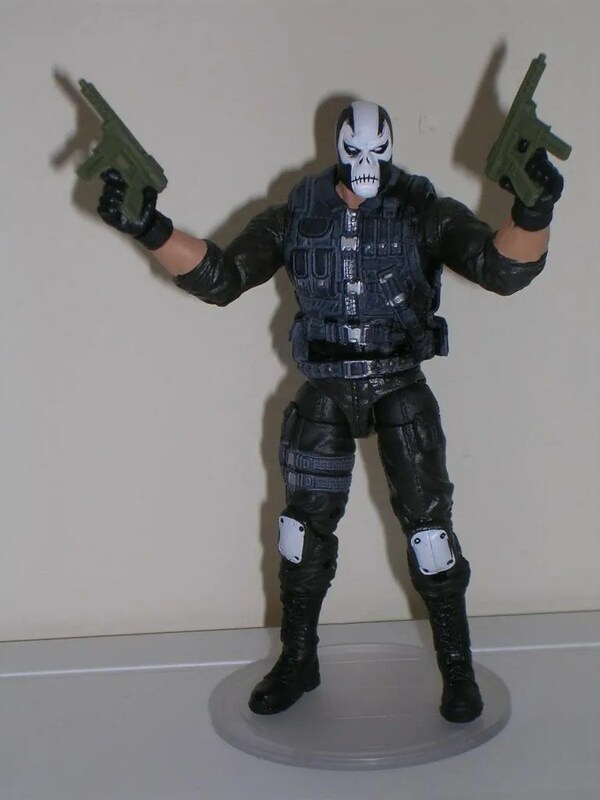 Crossbones features Hasbro’s standard modern 3 3/4″ figure articulation. The drawback is that his sculpted vest inhibits the torso articulation. He does, however have all the rest of the goodies including the double hinged knees, and yes those god awful ball jointed hips. 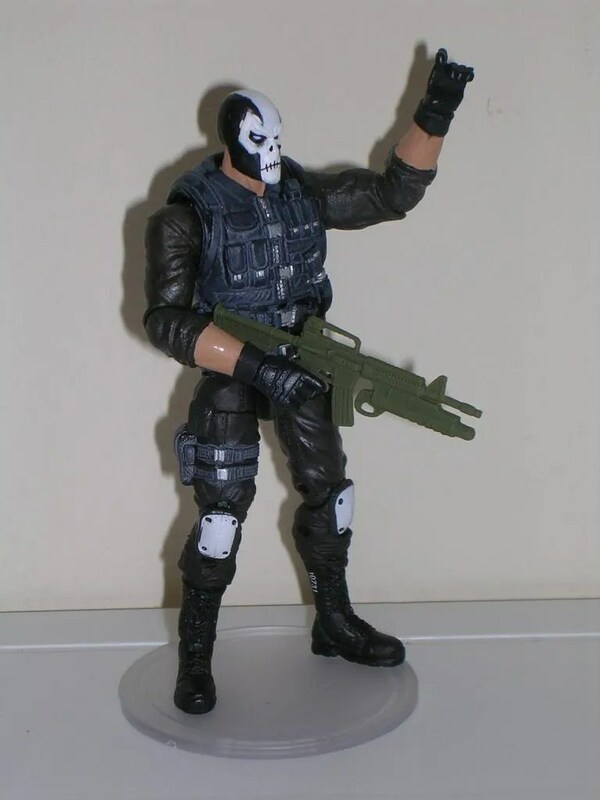 Either way, Crossbones is a very poseable figure. Accessories? Crossbones has three weapons. You get two small submachine pistols and an assault rifle. He can hold the weapons in either hand, but only his left hand is sculpted so that his trigger finger can slip through the trigger guard. The weapons are nicely sculpted, but I take issue with the decision to cast them in green plastic. So, wow. I never expected to actually own this figure, but if I ever did I had high expectations and they really panned out well. 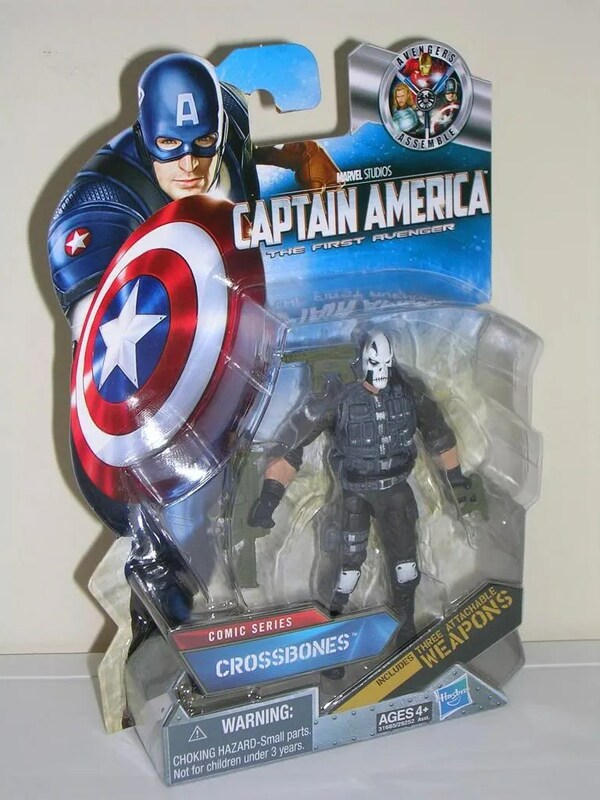 I realize Crossbones isn’t on the top of everyone’s Marvel villain action figure list, but the Captain America movie line made for a great way to release him. Something just tells me that if he were released as part of Marvel Universe he wouldn’t have turned out nearly this well. I think a lot of my excitement just comes down to this: I now have a Crossbones figure in scale with my GI JOEs. Damn, how cool is that?